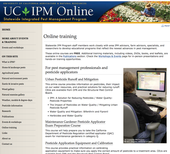 The UC IPM Web site offers several free online training courses for landscape and structural pest management professionals on topics including integrated pest management, pesticides and water quality, herbicides, pesticide equipment, and calibration. 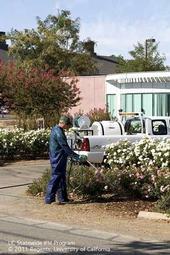 These courses offer continuing education units that satisfy the California Department of Pesticide Regulation (DPR), the Structural Pest Control Board, or both. Another course is designed to prepare you to take the DPR Maintenance Gardener Category Q Qualified Applicator Certification (QAC) exam.